Amrita Arora is celebrating her 40th birthday in Goa, with sister Malaika Arora and friends Kareena and Karisma Kapoor. Goa was lit up last night with a party bringing in Amrita Arora's 40th birthday, which is today, and when you count Kapoor sisters Kareena and Karisma as your best friends, things couldn't possibly get more glam. The dress code for last night's party appears to have been bling meets boho meets Jazz Age meets feathers. Kareena, for instance, looked exactly like a Native American squaw wearing sequins (dress created by the label Deme By Gabriella) to a party hosted by Jay Gatsby. Which is a great look - if it's not clear, we thoroughly approve. Kareena's sister Karisma Kapoor was a Thirties dream in a shimmering Reem Acra maxi dress, a feathered headband around her hair. 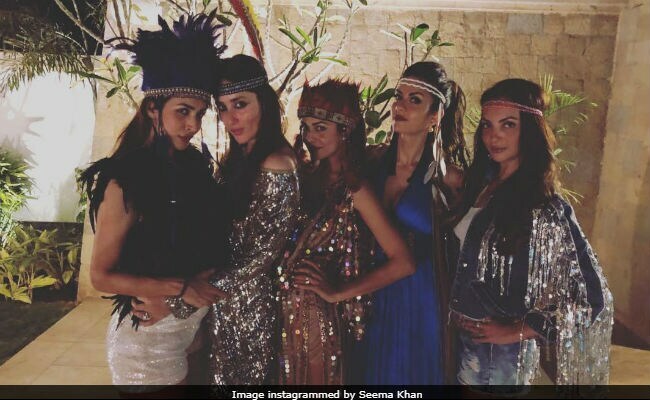 Amrita's sister Malaika Arora's elaborate blue headdress was set off by a tiny pair of white sequinned shorts and, a bit oddly for Goa, knee-high boots. The birthday girl herself matched a sequinned tunic with red feathers in her hair. The group was joined by actor Saif Ali Khan and Amrita Arora's husband Shakeel Ladak. Shakeel wished Amrita on his Instagram, with a picture of them together and a beautiful caption which read: "Happy birthday my love, fabulous at 40." Kareena Kapoor is scheduled to walk the ramp at the Lakme Fashion Week grand finale this weekend, closing the show for designer Anamika Khanna. Her next film, Veere Di Wedding, is scheduled to release on June 1.